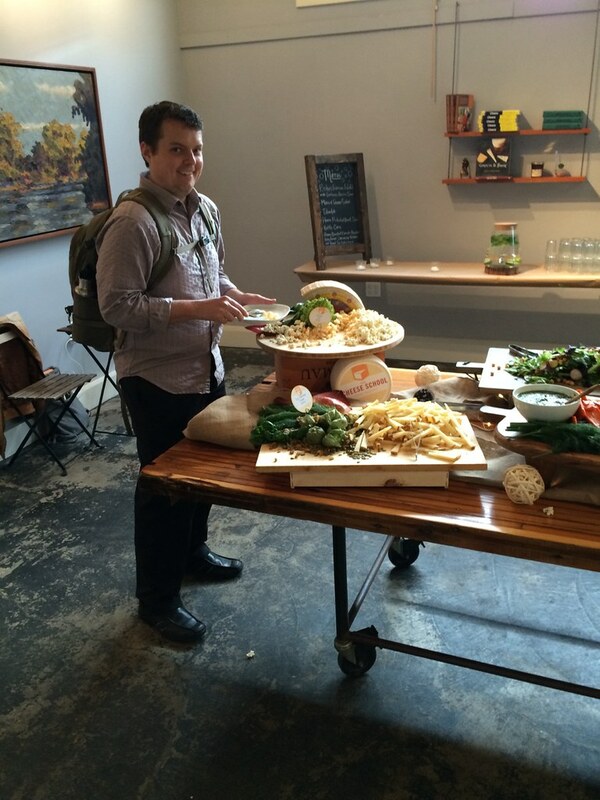 Neil and I heard about and event called “Cheese Makes Me Happy Hour”, how could we resist? It is an event regularly held at the Cheese School of San Francisco on Wednesday evenings through the end of September. (http://thecheeseschool.com/products/cheese-makes-me-happy-hour) Not only do you get to enjoy a bunch of tasty cheeses but they give you a token for a glass of wine or beer and put out quite a spread of tasty offerings. We chose to have a white sparkling wine by Sharfenberger and the Pepper Pot, a red Syrah blend from South Africa so we would have a variety to taste and pair with. There were three cheeses offered that evening, Piave, from Italy, Manchego from Spain, and Taleggio from Italy. We have included our tasting notes for both wines and all three cheeses. We know how much you all look forward to the pairings but we limited ourselves by only doing two pairings, the white wine and a cheese as well as the red wine and a cheese. We began the evening by tasting the sparkling wine. I noticed the wine to be crisp with apple aromas while Neil found it to be dry and brut. As we tasted the wine, I still identified apple flavors but Neil found the wine to be a fruity apricot. I also found the wine to have a lot of bubbles. Have you heard of the Sharfenberger brand before? I did some research and confirmed that the same guy is also the chocolate maker. How cool! I assumed from the name, the Pepper Pot, the red wine, would taste like pepper. As I swirled the wine, there was a pepper aroma but also a berry flavor that I couldn’t quite pinpoint, either cranberry or raspberry. Neil pondered if the berry might be boysenberry as well as identifying spice. We agreed that the lighter texture was pleasant. The wine was a little dry with blackberry flavors and a pepper finish that changed into a smokiness. We both enjoyed this wine and were happy to have chosen it. Out of the three cheeses offered that evening, we had only previously tasted Manchego, so we started with that cheese. The Manchego was a sheep cheese, from Spain, that had been aged for one year. We knew we’d like that, since we love aged cheeses! We both picked up on the dry, salty flavor of the cheese. I described it as kind of tangy and made note that it coated my tongue. Neil found it to have a creamy finish and a slightly grassy flavor. Since it coated our tongue we both thought it might be a nice one to pair with a wine. 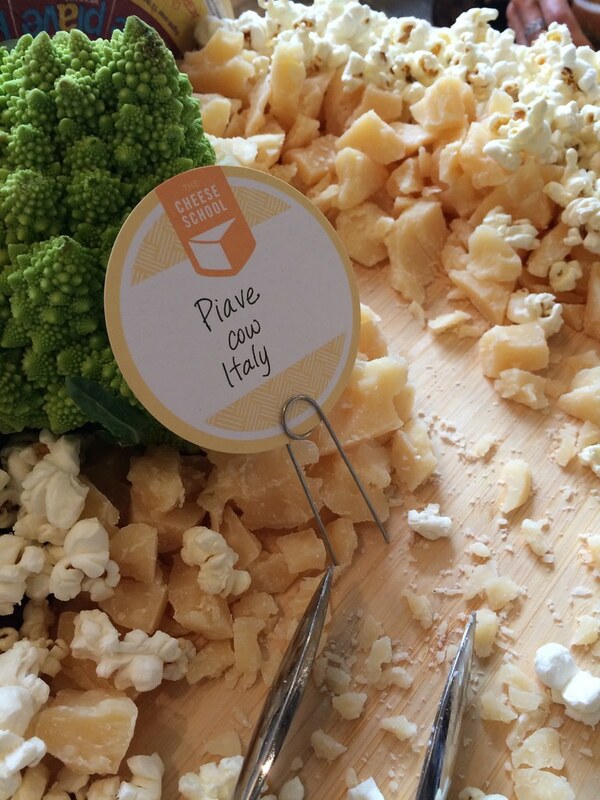 The second cheese, Piave, was a hard cow’s milk cheese that was a little drier than the Manchego. I enjoyed the crunchy texture and nutty flavor. Neil thought it was salty and funky with a very dry start and creamy finish. He also found it to have a heavy cow milk taste. This is another wine that coated my tongue, looks like we have another wine pairing possibility! 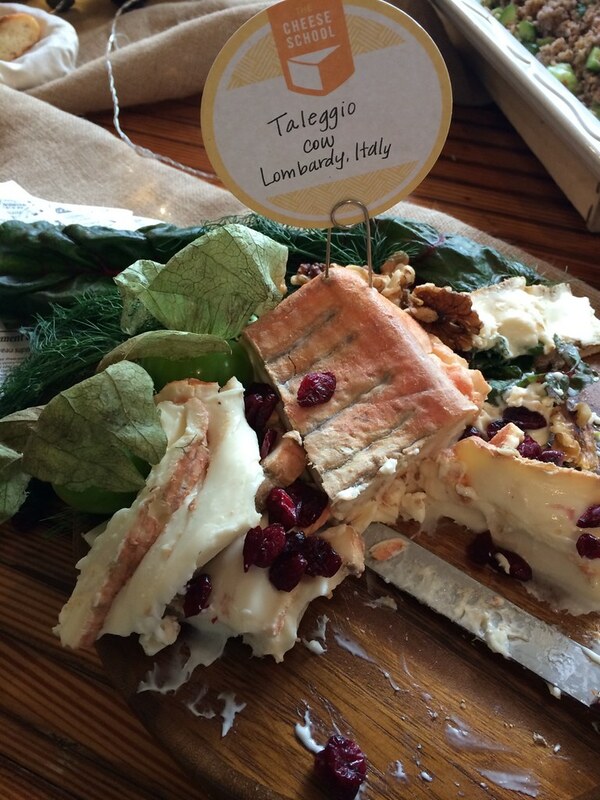 Our final cheese, Taleggio was a soft cow’s milk cheese from Italy. The flavor started out mild and then got funky. Neil thought the flavor was pretty big, and noticed it to be funky or hay flavored. He described the texture as creamy but I thought it was more slippery. The other cheeses seemed like better choices for wine pairing. Neil chose to pair the Sparkling white wine with the Manchego cheese. He described it as a pleasant pairing where both the wine and cheese stayed pretty consistent in their flavors. My pairing of the Syrah blend with the Piave cheese had similar results. I did notice a meat aroma at first, in the wine, which would have been from the smoky finish. Besides that, the cheese was still dry and the wine had the pepper notes, not much of a difference in the wine or cheese. 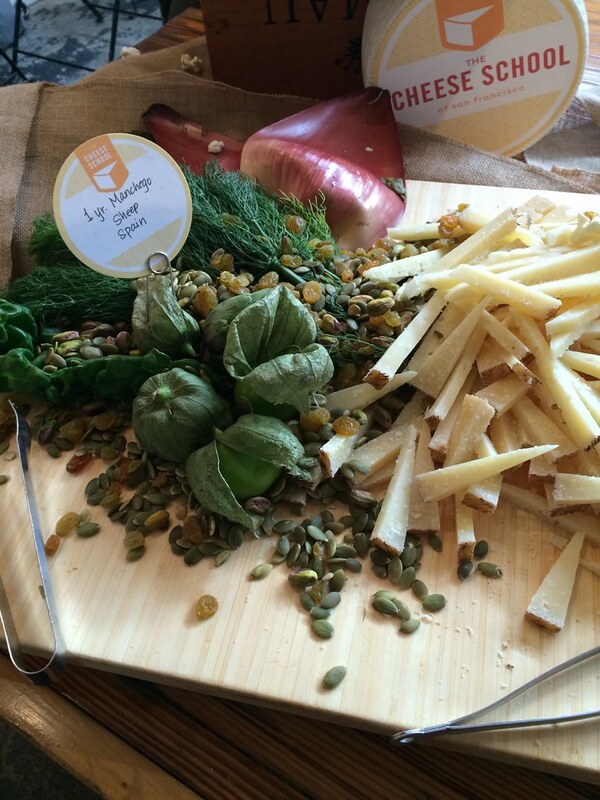 Although neither pairing had any new flavors appear, it was still fun to create some pairings. 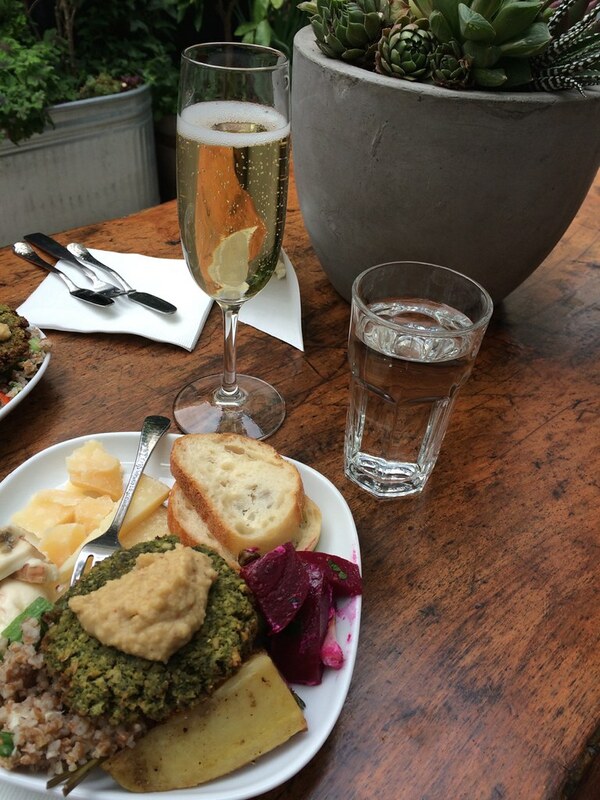 After we completed all our WineAndCheeseFriday notes, we enjoyed the other foods available and had a nice evening. We would definitely go back! One note though, the event is held outside so be prepared with your San Francisco layers. There are blankets provided too, just in case you forget. I’m sure most of you will enjoy this cheese “happy hour” too!